in support of legal trade in rhino horn. Lynne MacTavish has worked at Mankwe Wildlife Reserve for the past 17 years as Operations Manager. 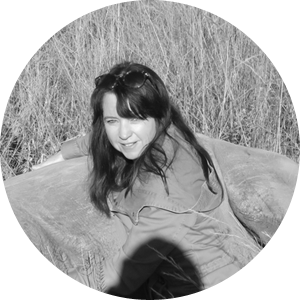 She is also the Principal Investigator on the Earthwatch Project; conserving endangered rhino in South Africa. To date, she has led 57 research teams. She finds being involved in research and education very rewarding and has recently co-authored nine scientific publications. She assists with all aspects of running the reserve and plays an active role in anti-poaching and rhino protection. The reserve hosts 13 UK Universities and 8 Earthwatch research teams every year. Lynne has a passionate desire to save the rhinos in South Africa. She delivers lectures on the rhino crisis to over 400 students per year. These students come from all over the world and she hopes that their voices will join hers to create awareness internationally. She has also worked with several film crews from the UK, France, USA and Australia to try and highlight the severity of the war on our rhino. She has had first-hand experience of the devastation and trauma caused when she lost her own rhino to poachers and she is determined to make their deaths count for something. Lynne is a self-professed “bunny hugger” and has spent most of her life rehabilitating orphaned and injured animals. However, she is also a conservationist and she understands the reality of trying to protect wildlife in our current world. She understands that being a true conservationist requires strength and the ability to be brave enough to make very difficult decisions to ensure the wellbeing of a species. Since the international ban on the trade in rhino horn was put in place in 1977, hundreds of thousands of rhinos have been poached throughout their range. In South Africa, up until 2008 it was legal to trade domestically in rhino horn. While the populations of rhino in all our neighboring countries had been gradually decimated, South Africa still had a growing population of over 20 000 white rhinos and there were less than 20 poaching incidents per year. Since the domestic trade ban on rhino horn was implemented in 2008, South Africa’s rhino poaching incidents have increased by 7000%, with over 1000 rhino being poached per annum. The costs of protecting them, both financially and emotionally, have caused over 100 rhino owners to give up and get rid of their rhinos – leading to the loss of 400 000 hectares of prime rhino habitat. Essentially what the ban has achieved is to make a dead rhino worth more than a live rhino. The ban has created a lucrative illegal market where the only beneficiaries are criminals, terrorists and unscrupulous fund-raisers who exploit donor funds. It therefore goes without saying that these are the two parties fighting legalization the hardest, as both would suffer great financial loss if there was no rhino poaching. The elephant ivory issue and the rhino crisis cannot be compared: a rhino does not have to die for its horn and it can happily reproduce and live a normal life without its horn. An elephant, on the other hand, must die to have its tusk removed. The one-off sale of ivory was set up to fail – nine-year sale moratoriums were attached to these auctions, which encouraged buyers to trickle the horn they had bought onto the market over this period. We are proposing regulated trade to supply the demand from the horns of rhino that have had their horns removed to protect them from poaching. This is entirely different to the one-off sale of ivory. To save the rhino, we must make it worth more alive than dead. To do that, we must decide to save the animal and not its horn. To demonize rhino owners and private reserves and to make claims that we are only in it to get rich simply demonstrates the ignorance of the self-important animal activists. It is obvious that they have never had to care for, or protect a rhino. If they had, they might be a little more understanding. Until you have sat in the blood of your dying rhino and seen her mutilated body and known the great suffering this animal has endured, DO NOT try to tell me how rhino owners must feel or why they make the desperate decision to dehorn their rhinos. All the animal activists condemn us and tell the world that we are in this for the money. Have you EVER considered the trauma we go through daily; how we have risked our lives trying to protect a species and how our family and staff are in grave danger every single day? To put things into perspective, it costs about $35 000.00 per year to protect a rhino adequately. We receive no help from government or NGOs! We have been paying these bills since the rhino crisis started eight years ago, and even if we were able to sell the horns of our rhinos we would never recover the costs of the past eight years. The sale of horns would give us the desperately-needed income to carry on and give us the means to protect the surviving rhinos. Without these funds, we will be forced to give up, like the 70 rhino owners that gave up just last year. All we are trying to do is save the rhino and not its horn, and to take the trade out of the hands of poaching syndicates, terrorists and criminals and place it in the hands of conservationists. By legalizing the trade in rhino horn we will make the rhino the most valued and protected species in the world. But more importantly, we will stop the cruelty. Is it not more humane for the rhino to have its horn removed under anesthetic by a qualified vet, than hacked off while it is alive by an axe-wielding poacher? It is time that we realise that the ban on the trade in rhino horn has made the horn the most valuable commodity in the world, and while the rhino has a horn on its head it is not safe anywhere; not even in a Zoo in Europe. The only way to give the rhino any chance of survival is to remove the thing that is killing it. Then, instead of the horn collecting dust in a vault, why not sell it and use the funds to better protect the dwindling population, not only on private land but in our National Parks too? Is it not time to let the very thing that is killing them, save them? We need to be their voice, we need to give them that option before it is too late. 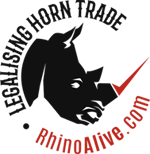 RhinoAlive.com is an awareness campaign initiated by a group of conservators, rhino lovers and rhino owners. AN URGENT CALL FOR LEGAL TRADE IN RHINO HORN!